Once in a while an author creates a world that combines humor, action, danger and the grit of a desperate battle for survival, transporting readers out of their reading chair and into the heart of the unfolding tale. C.M. 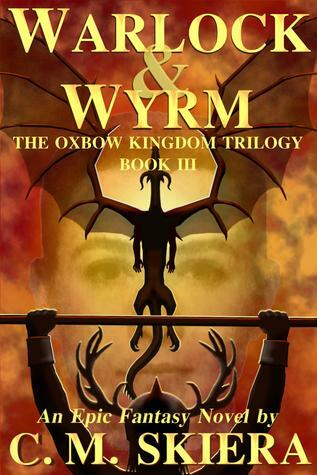 Skiera has done that with his Oxbow Trilogy, building a world of fantasy that is filled with characters that will steal your heart, characters that will raise your ire and evil that seems insurmountable! An evil imposter has poisoned the King and Queen and kidnapped the fair Princess Giselle. Young Jetsam has done all he could to save the great wizard, Seryn from death and now only Seryn can save his brother, the King and the woman they both love with his magic and potions as Jetsam begins his quest to save the princess. Meanwhile, a far greater danger looms on the dark horizon for the kingdom of Oxbow and Ratboy will find himself more than just a leader of the lost boys in their underground world as he must become a warrior himself and shoulder the responsibilities of making decisions that will require the utmost faith in those who were once considered the enemy. Can Ratboy ask his young followers to take up the call to war, knowing their chances of survival are low? WARLOCK & WYRM is the stunning conclusion to an epic tale of survival, coming of age, allegiance and sacrifice that hits with the force of a tsunami, page after page! C.M. Skiera has built a world to believe in, heroes to cheer for and tension that never lets up as once again, good versus evil meet on the battlefield where unlikely allies stand together, finally united in understanding and acceptance. I cannot recommend C.M. Skiera’s Oxbow Trilogy enough to anyone who wants to feel part of another world whose heart beats on the pages of every scene. I am voluntarily reviewing WARLOCK & WYRM!